By John Tyndall. 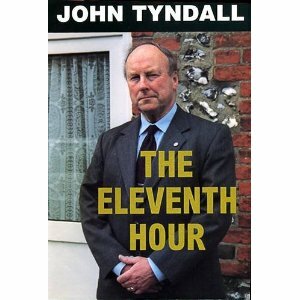 The Eleventh Hour has been described as the 'Bible' of the British National Party. First published in 1988, the new (1998) edition was updated to take in the many new developments on the political scene occurring since. The book gives comprehensive coverage of all the major current issues affecting Britain. It delves into the ideologies of liberalism, conservatism and the left, and also examines that of British Nationalism and its background. It contains extensive analyses of the British economy and political system. It looks at issues connected with freedom and order, the mass media, the environment, race and immigration, Northern Ireland, the Commonwealth, foreign policy and defence. It also gives a detailed outline of the development of the BNP and its predecessor organisations in Britain. The Eleventh Hour comprises 549 pages, it is partly autobiographical, giving an account of the author's origins, early political awakening and subsequent life's work.